The new jobs numbers reported Friday are not spectacular by the standards of the last couple of years. But they also signify a sigh of relief. A weak job growth number in February had appeared to be the most solid evidence yet that the United States economy was slowing, and perhaps even that the expansion might be near an end. 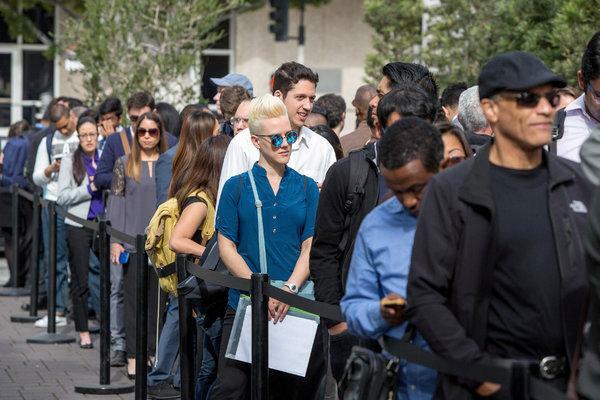 The Labor Department originally reported that employers added a mere 20,000 jobs that month. Even after new revisions, that number came in at only 33,000. The March number — 196,000 positions added last month — makes clear that February was an aberration, not a trend. For all the fluctuations in financial markets and pessimistic commentary at the end of last year, the great American job creation machine is still humming. Over the last six months, the economy has averaged 207,000 new jobs a month, which is actually better than the results in 2017 and only slightly behind the rates of 2018. But even as the numbers give some assurance that the economy isn’t falling off a cliff, there’s nothing in it that will give the Federal Reserve reason to reconsider its approach on interest rates. Average hourly earnings rose only 0.1 percent in March, and are up 3.2 percent over the last year. Inflation is low enough that this represents rising incomes for American workers. But this is hardly the stuff of an inflationary outbreak that the Fed will feel compelled to stop with an increase in interest rates. The Fed, which has decided to put off rate increases indefinitely, has become increasingly comfortable with a tight labor market and jobless rates that, in the past, it would have viewed as a precursor to overheating. With the March rate at 3.8 percent, the jobless rate has been at 4 percent or lower for a full year. The stable unemployment rate in March masked negative trends in the share of Americans looking for work. The labor force participation rate fell by 0.2 of a percentage point, and the ratio of the adult population working fell by 0.1 percent. That is probably a statistical aberration, but taken at face value it implies that the progress toward pulling more Americans into the work force has not been as consistent and compelling as it had seemed. Combined with other significant data points — like surveys of business activity and retail sales — the latest readings on the labor market support the idea that this is a resilient economy. In December, a sharp sell-off in the stock market coincided with a rise in pessimism in surveys of business leaders. The report is a reminder that even if growth slows in 2019, which forecasters expect, a slowdown is not the same as a recession, and certainly not the same as a collapse. So far, the ominous signs about the economy — such as longer-term interest rates falling below some short-term rates, and weak reports on retail sales in December and on the labor market in February — are not reasons to panic. In other words, as long as employers ignore the latest fluctuations in financial markets and make their hiring and investment decisions based on demand for their products (which is strong) and availability of credit (which is easy), this expansion should have room to run yet. Previous PostPrevious Your Money: The New Equifax Boss Wants to Make Amends. We Have Some Questions.